In this paragraph, Paul warns the Colossians against the influences of bad religion. More specificially, he tells Christians not to let false teachers judge them by their religious observance or spiritual experiences. Many scholars believe that Paul had specific opponents in mind when he wrote the letter, likely a group of Judaizers (strict Jewish Christians who taught that salvation was open to Gentiles through Christ, but that all must obey Torah to be saved) like those who corrupted the Galatian churches. While this is quite plausible, I struggle to see that Paul is singling out any particular group or teacher, as he does in Galatians or 2 Corinthians. It seems more likely that the apostle is drawing on his long experience and warning the fledgling church about the types of false teaching that he has seen creep into churches elsewhere. He is alerting the church that attacks will come from both sides – from Jewish teachers and pagans alike. In verse 16, he is clearly sounding the alarm against Jewish Christians who would seek to place Gentile believers under the yoke of Torah. Food laws and holy days were essential to the life and culture of Judaism, and Jewish converts would have sensed no need to abandon these. But Paul is clear that the Gospel does not demand Gentile believers take up these practices. No doubt he is remembering here the words of Peter at the Jerusalem Council: “Now then, why do you try to test God by putting on the necks of Gentiles a yoke that neither we nor our ancestors have been able to bear? No! We believe it is through the grace of our Lord Jesus that we are saved, just as they are.”[i] Torah observance never saved anyone; therefore the Gentile Christians could not be condemned for failing to keep it. Once again Paul returns to the theme of the fullness of God, echoing a line from the previously cited hymn (1:19): For God was pleased to have all his fullness dwell in [Christ]. 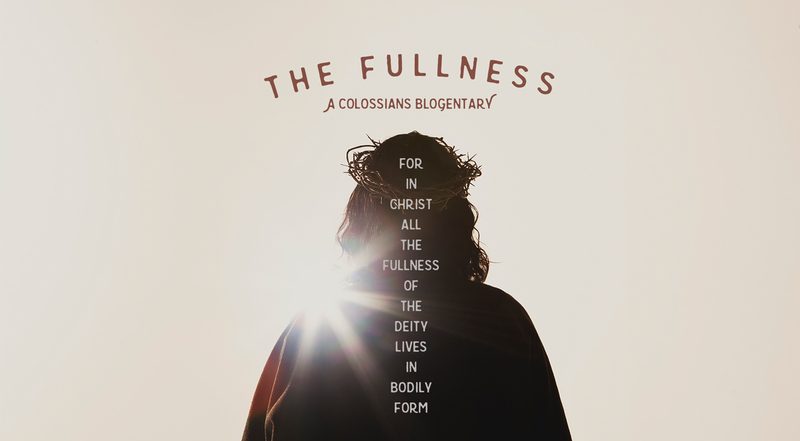 Jesus is the embodiment of the fullness of the Deity. Everything that is true of God is also true of Jesus (excepting, of course, those attributes which cannot be contained in a body, such as omnipresence). Jesus is not, therefore, a second-level deity, or an exalted man, or anything less than God incarnate. “He is the embodiment and full expression of the one God of Abraham, Isaac, and Jacob.”[i] Jesus is, quite literally, Immanuel, God with us, God among us. If what you believe about God does not fit the person of Jesus as revealed in the Gospels, then what you believe about God is false. These three verses offer, first, an encouragement to continue to live faithfully for Christ, and second, a warning against being taken in by false teaching. It is never enough that someone simply “prayer the prayer of salvation” and then go on about their business as though nothing significant had actually happened. Embracing Christ is a cosmic event with eternal ramifications. It is not simply a one-time transaction, but rather the beginning of an eternal relationship with one’s Creator and Redeemer. Embracing Christ is a cosmic event with eternal ramifications. Paul is fond of using variations of the phrase “in Christ.” To be in Christ means to be intimately connected to Christ. The larger idea is familial. To be in Christ means to be a member of his family. No doubt this phrase, for Paul at least, carries with it intonations of God’s covenant with Abraham. When someone receives Jesus as Lord, they enter into a long-standing covenant family, borne out of God’s promise to Abraham, consummated by Christ Jesus at the cross, and extended by the Church to all peoples as an offer of grace through faith. 1 I want you to know how hard I am contending for you and for those at Laodicea, and for all who have not met me personally. 2 My goal is that they may be encouraged in heart and united in love, so that they may have the full riches of complete understanding, in order that they may know the mystery of God, namely, Christ, 3 in whom are hidden all the treasures of wisdom and knowledge. 4 I tell you this so that no one may deceive you by fine-sounding arguments. 5 For though I am absent from you in body, I am present with you in spirit and delight to see how disciplined you are and how firm your faith in Christ is. Paul continues his use of the athletic metaphor from the end of chapter one by using the word “contending” to describe his work for the churches. He is not simply putting in his hours; he is actively engaged in a competition, of sorts, on behalf of the Gentile churches. As he says in Ephesians 6, Paul recognizes that he is not contending against other human beings (as tempting as it may be, at times, to think of it that way), but against the cosmic forces of darkness that are manifest in temptation to sin and heretical teaching. Knowledge of the mystery of God, who is Christ. Paul had never met the Colossians, but he saw his present imprisonment and consequent sufferings as being on their behalf. He understood his ongoing trials as a participation in the suffering of Christ. When he uses the term “lacking” in reference to “Christ’s afflictions,” he does not in any way diminish the salvific effect of the cross. As Wiersbe notes, “The word afflictions refers to the ‘pressures’ of life, the persecutions Paul endured. This word is never used in the New Testament for the sacrificial sufferings of Jesus Christ.”[i] Paul’s imprisonment does not work salvation for the Colossians (or Paul, for that matter); instead it serves as the fulfillment of Jesus’ own prophecy: “If the world hates you, keep in mind that it hated me first. …If they persecuted me, they will persecute you also.”[ii] Paul is continuing the work of Jesus. In fact, Paul clearly understood that it was Jesus himself accomplishing his work through Paul. In this sense, Christ’s afflictions were not finished. The Lord must continue to suffer through the suffering of his people, all for the sake of his church. Suffering, in fact, is fundamental to the vocation of the church. “Just as the Messiah was to be known by the path of suffering he freely chose – and is recognized in his risen body by the mark of the nails – so his people are to be recognized by the sufferings they endure.”[iii] In imitation of Christ, the Church is called to suffer and die at the hands of the world for the sake of the world. In imitation of Christ, the Church is called to suffer and die at the hands of the world for the sake of the world.